Spring 2019 enrollment remains strong and the District is on track to meet the annual FTES targets established by the Chancellor’s Cabinet. With spring mostly completed, the Chancellor’s Cabinet is now turning its focus to the 2019 Summer Session, which begins June 3 at the colleges and June 8 for Continuing Education. This includes putting in place contingency plans for each institution to add additional sections if necessary. The Chancellor’s Cabinet will continue to closely monitor enrollment through the conclusion of spring and start of summer. In March, Chancellor Carroll shared an important budget message that highlighted some proactive steps being taken to meet some districtwide challenges. Already, the District Office, each of the colleges, and Continuing Education have identified nearly $8 million in expenditure reductions. In addition, a modified hiring freeze is being enacted to provide additional flexibility to meet future challenges. The Chancellor’s Cabinet is following the state budget situation closely, since current-year revenue projections have a significant impact on the possibility of future budget reductions. The Cabinet will continue to advocate for additional funding for the state’s community colleges. Fortunately, California’s Department of Finance now says the projected deficit in tax revenue may not be as bad as was forecast by the California Community Colleges Chancellor’s Office. A clearer picture of the state’s fiscal health will be available when Governor Gavin Newsom releases his “May Revise” budget update early next month. Attorney General Xavier Becerra recently announced that South Carolina is the latest state to be added to California’s travel ban list. With some exceptions, California law forbids state agencies and universities from using taxpayer money to sponsor travel to the states that discriminate against lesbian, gay, bisexual, and transgender people. 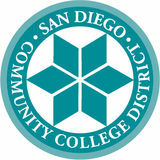 The SDCCD Board of Trustees adopted a resolution directing the District to comply with the requirements established. South Carolina becomes the tenth state on the travel ban list, joining Alabama, Kansas, Kentucky, Mississippi, North Carolina, Oklahoma, South Dakota, Tennessee, and Texas. Significant progress is being made toward implementation of a new student information system, PeopleSoft Campus Solutions. 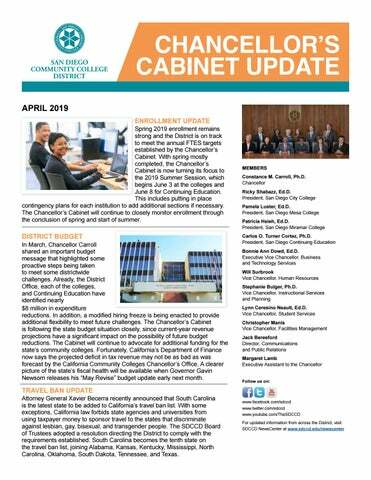 Starting with registration for Summer 2019, which begins in May, students and employees at the colleges and Continuing Education will transition to the new system, branded mySDCCD. In anticipation of this important milestone, many District employees are undergoing training to learn the new system so they can assist students and ensure a smooth transition of important business functions. A comprehensive communications campaign is also underway to inform students, with several roadshows planned on the campuses to support them as they begin registration for summer. The Chancellor’s Cabinet is closely following implementation of the new system as the student “go live” date approaches. For many District students, this summer will be an opportunity to participate in a study abroad experience. Under the leadership of the Districtwide International Education Committee, this summer’s study abroad offerings are more robust than ever. Students have the chance to earn academic credit while traveling to places such as Costa Rica, Madrid, Florence, Paris, London, Barcelona, and the Philippines. Program fees, which do not include airfare, range from $1,985 to $3,275, but scholarships and financial aid are available. To celebrate the academic achievements and civic contributions of community colleges, April 2019 has been declared “Community College Month.” A statewide and national campaign, Community College Month is an opportunity to raise awareness of the importance of these institutions to the lives of students and their communities. During April, the District will join with its colleagues through consideration of a Board Resolution, publicity opportunities, and social media posts featuring the hashtags #CCMonth, #celebrateCCCs, and #chooseCCCs.